[ Updated 2018-09-14: ] Sometimes, especially when traveling, I just want to know what will be falling from the sky in the next day or so. Weather.com used to provide regional maps of how much precipitation (and what sort) to expect over the next 24 hours, but those have been discontinued. 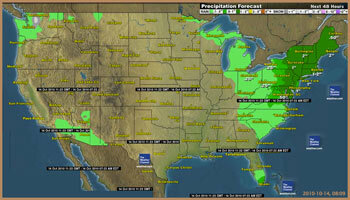 What we can access now is maps based on satellite data showing current precipitation. I have stitched together nine of these maps to produce a US precipitation graphic (about 1440 x 760 pixels; link opens in a new window). The images are pulled directly from weather.com's image server, where they are updated hourly. My normal working environment is a MacBook Pro. Paul Hammond's webkit2png is exactly what’s needed to fetch a Web page and save it as a .PNG file on a Macintosh. The first line invokes python and feeds it the webkit2png script. Note that you must give the full path to python on your system in order that it can locate all the necessary libraries. The second line is the URL of the US precipitation map. The third line specifies where to put the output file (-D option) and how big to make it, in pixels. The fourth line says to save only a thumbnail of the .PNG and what scale factor to use for it — I use 0.7 and this results in a file of about 800KB on disk. The final line gives a name for the output file, which is based on the date and time, e.g. 2010-01-23+08-01-thumb.png (the -thumb.png is appended by webkit2png). Weather maps build up in my ~/wx directory at a rate of one per hour. It's a simple matter to select ten or a dozen recent maps, open them in Preview (in a single window), and use the arrow navigation keys to get a simple animation of the weather pattern history.